The sheer volume of users & engaged consumers using Google My business means you need to be present, active and showing your prospective clients you are the right local business to call & book an appointment. In this article, I’ll share with you the recipe we use to optimise Google My Business Listings & share some tips so you can implement these strategies to get ahead of your competitors and generate more enquiries. Google Maps Marketing should form a broader digital marketing strategy. Google Maps marketing allows you to increase your business visibility & showcase the values, services & products you provide. Once you have an active Google my Business page you will notice that positioning becomes crucial just like a typical Google Search where the website found in the top 3 positions is more likely to be clicked on and contacted than a website featuring toward the bottom of a results page or even page 2. Why should I invest time & resources into Google Maps Marketing? Your business being found toward the top of a Google Maps search is the reason you should consider your marketing strategy. 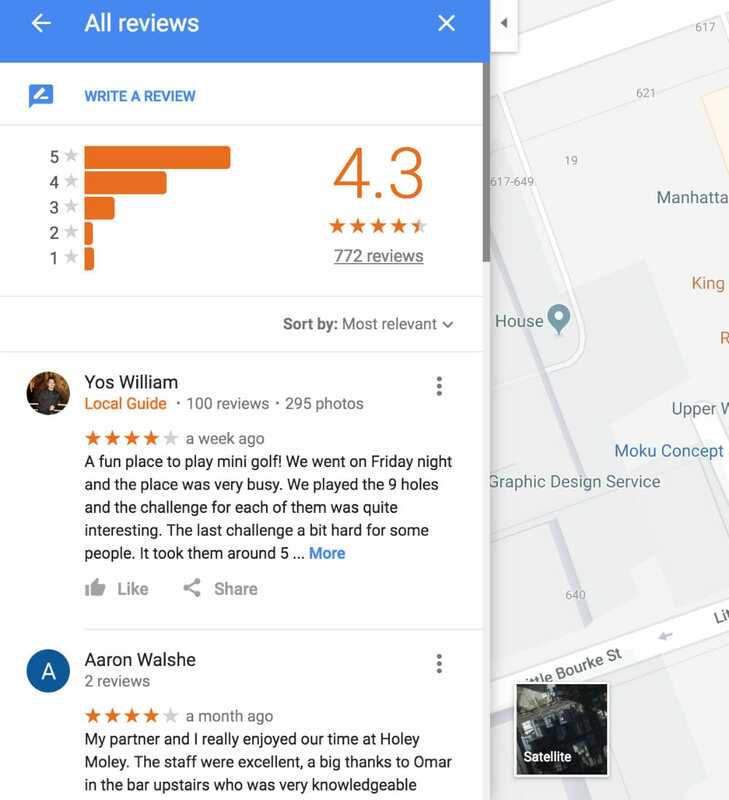 89% of consumers use Google reviews which feature prominently on your Google My Business page & 92% of these users were influenced by the Google reviews in their decision making. 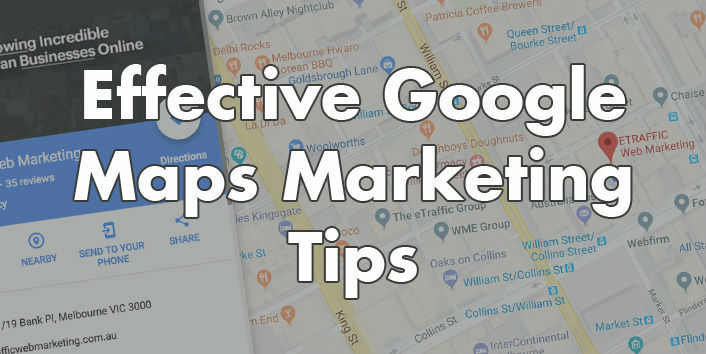 A consistent Google Maps marketing strategy will elevate your brand and generate more qualified leads to your business. In this example, I searched for “chocolate store” and received this result. 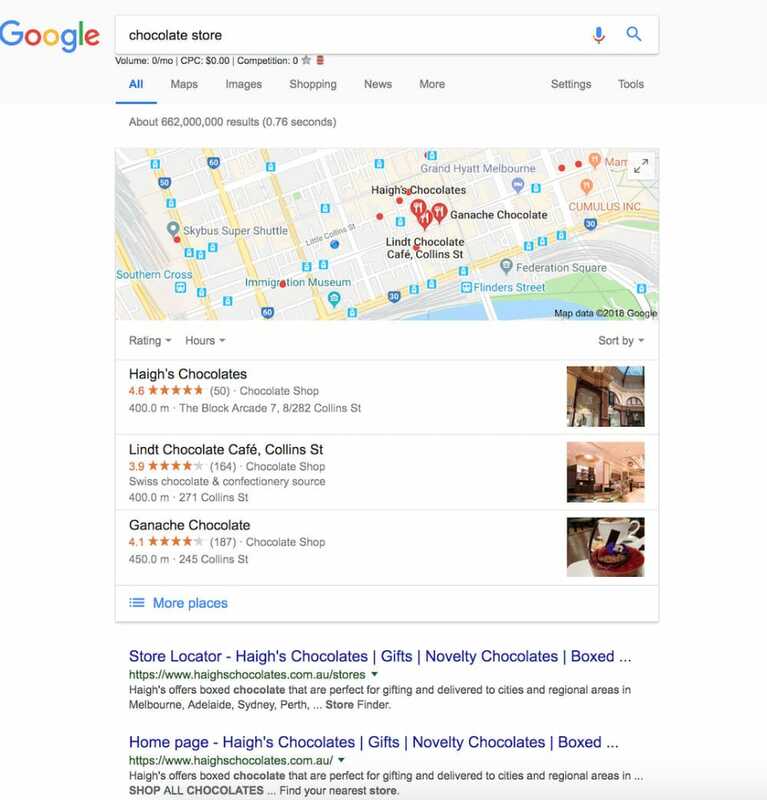 You will notice that Haigh’s Chocolate has secured the 1st position in the Google My Business Listings for a few reasons. You will also see that Kinder have appeared at the top due their Google Adwords Campaign. The Google Maps optimisation rank formula is not too dissimilar to the Google Adwords & the SEO formula in the way that the authority, location, reviews, categories & descriptions all play a pivotal role in positions in Google. Google maps listings are prioritised into places based on a user’s location which is illustrated with the above example where Haigh’s Chocolates closest location is only 260 metres away (lucky me) however there are additional results provided should I seek an alternative to Haigh’s chocolate. The two other search results show Lindt & another business Ganache both of these are further away from me hence the search result. It’s clear that proximity plays a huge role in positioning and rightly so given that the closest result would more often than not be the most relevant to me as a consumer. How about businesses that don’t have a physical address they work from? How can you optimise a Google Business Listing when proximity becomes less of a factor? Google Reviews, Content Fulfilment, Categories, Google Posts & your actual website menu structure all carry weight and form your positions in Google Listings. We are seeing Google increasingly introduce results surrounding where you are searching which can feature a key phrase such as “near me” which helps Google provide the most relevant result. Proximity based Map results are common, however we need to be mindful that not every user has location enabled on their mobile device which then makes the location based results less of a factor in producing results naturally. This is when the full force of an optimised Google Maps listing shines through. Let’s look at an example of a competitive industry where location is paramount. 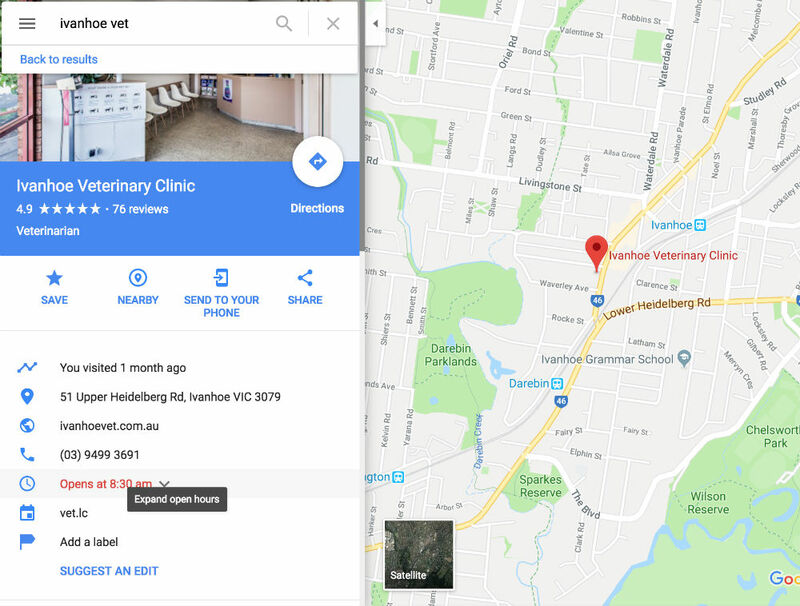 See the image below where we have taken results from a Google Maps result for Vets in Ivanhoe, Melbourne. 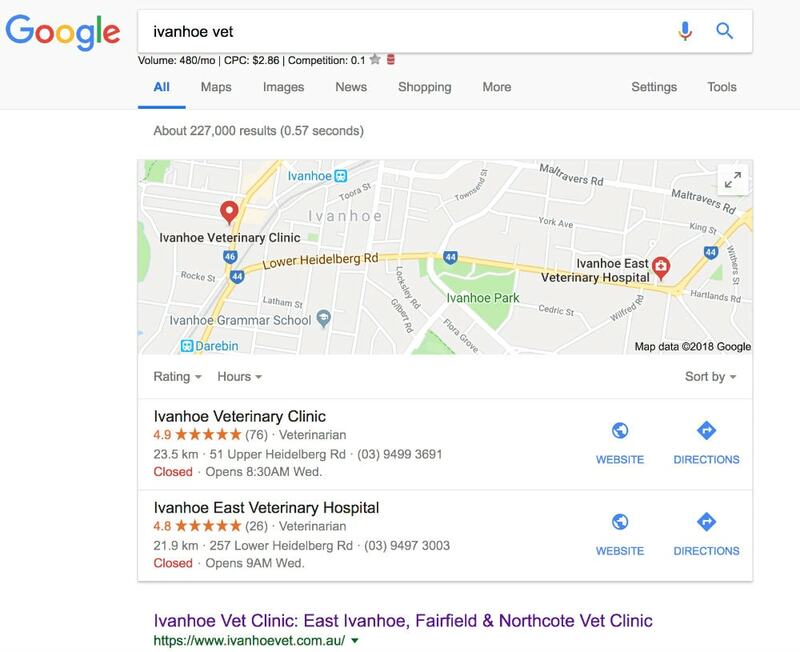 As you can see here Ivanhoe is occupied by several Veterinary Clinics which drives the Cost Per Click & overall competition when generating new leads. At the top of the list is Ivanhoe Veterinary Clinic that has an average patient rating of 4.9 out 5 from a strong volume of reviews currently sitting at from 76 Google reviews. Now, we are going to explore the marketing side of Google Maps. When I conducted this google search, I looked for a vet which is 20kms away from my location which eliminates proximity to a degree. You can see that the Google Business Page appearing at the top has a complete structure from category, content, hours, destination links, appointment URL’s and an anchor from a Google Reviews Widget that directs users from the website back to the Google reviews which influences users decision making. It becomes a much easier decision to contact any business when you see 76 people providing consistently positive feedback. How to claim & Use Google My Business? Claiming a business listing on Google and completing the bare minimum information is surprisingly common & is a HUGE no no. Not only does an incomplete Google business page look unprofessional, you are not giving your prospective customers a reason to choose your business over your competitors. Ensure you use your complete address with accurate information, this should match all citations across the web to ensure your NAP (Name, Address & Phone number) are correct. Some businesses have a physical office/store, but some business types also provide products and services to a wider area. An example of a business like this would be a courier, pizza delivery etc. 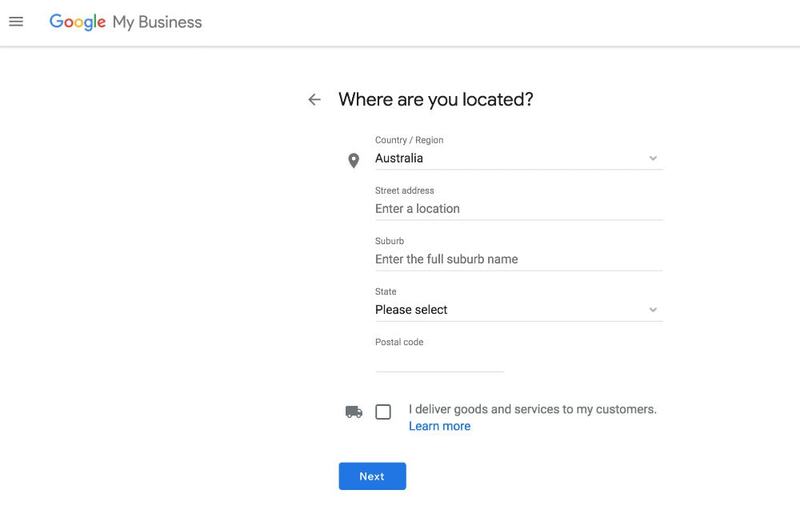 If this applies to your business, it’s crucial that you state which areas your business services in your Google My Business Listing. Consider including the names of suburbs or cities that you serve. Verifying the Google My Business listing is the next piece of the puzzle. 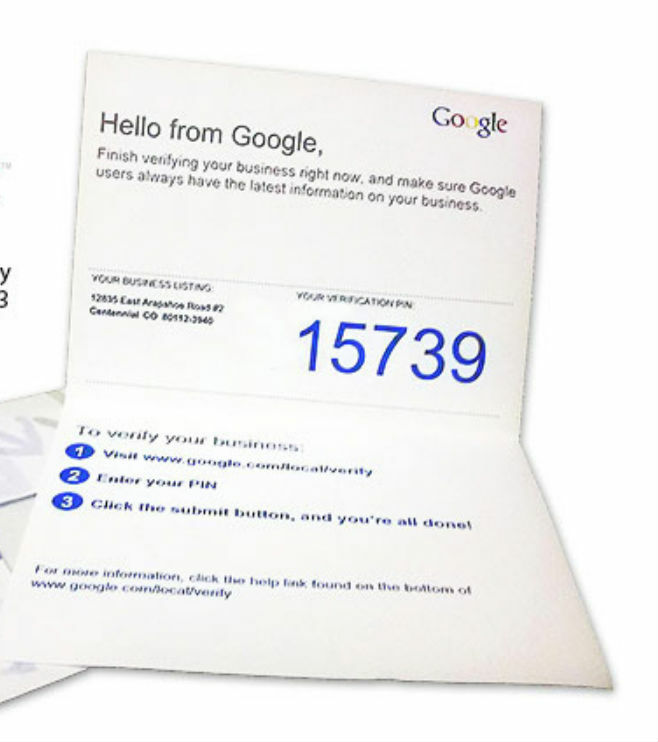 The verification process is required to ensure you really are an active business in that location and as such verification typically occurs by Google mailing you a postcard with a PIN. 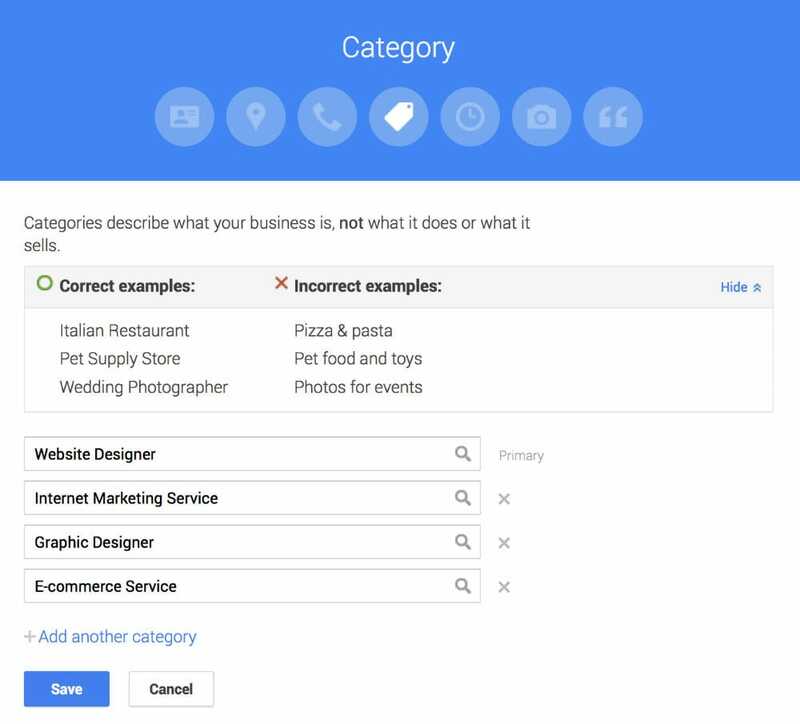 It’s crucial you select the most appropriate primary category when setting up your Google My Business profile, this should match your main keyword for your website you are targeting and menu structure. Once you have selected your primary category you need to then select additional categories that are relevant to your business. This step allows you to further optimise your Google My Business listing if your company provides multiple services. As an example if you run a digital marketing agency, you may set “Internet marketing” as your primary category (obviously this depends on what your core focus is) and then select SEO, Google Adwords, email and social media marketing as your additional categories. The greater amount of detail you provide the better chance you have to gain better rankings through your optimised Google my business listing. 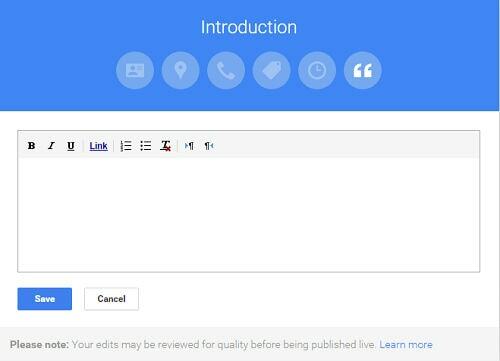 You have an opportunity to share your company story & values succinctly in the Google My Business Introduction section. Highlight products, services & expertise you offer so you can showcase why a consumer should contact you as opposed to a competitor. This is another missed opportunity by many businesses who elect to leave this section blank. Utilising photos in your Google Maps profile is a great way to connect and give consumers a visual identity of who you are & the quality of work you provide. Google Maps listings that feature images are much more engaging than GMB listings without photos, so make your business stand out with some quality photos. In the below example of an optimised Google Maps Listing you can see how photos help people see how fun this venue is and what they can expect to experience. Google does not provide any insights into their algorithm however it’s clear that Google reviews elevate your credibility and influence decision making but its unclear as to what influence reviews have in terms of rankings. Requesting feedback from clients is encouraged and utilising the Google reviews is a powerful way for your clients to share positive experiences about your business. In the event a negative Google review is placed on your business listing – you should see this as an opportunity to engage the person and seek to understand how the situation could be better handled moving forward and if there is an opportunity to fix the issue. Negative Google reviews are a huge reason business steer away from seeking feedback however if you have a plentiful amount of positive reviews with a couple of out-liars it doesn’t have much of an impact on your business, on the flip side if you have consistently negative feedback which shows trends and a level of complacency this will hurt your business. If you believe you have fallen victim to a fake review or slanderous you can report and raise this with Google support directly. Google has become very robust and implements structures to eliminate dodgy tactics to boost rankings quickly without merit. If you follow the above structure & implement best practice along the way from a Search engine Optimisation perspective you will see positive results in the not too distant future. By following this guide and implementing best practice for your business you give yourself the best opportunity to gain greater market share and share your business story with the world. In many cases, this is a lot of effort & if you are running business and you are busy working in the business our Google Maps Ranking team is ready to help you get on top of your Google Maps area.